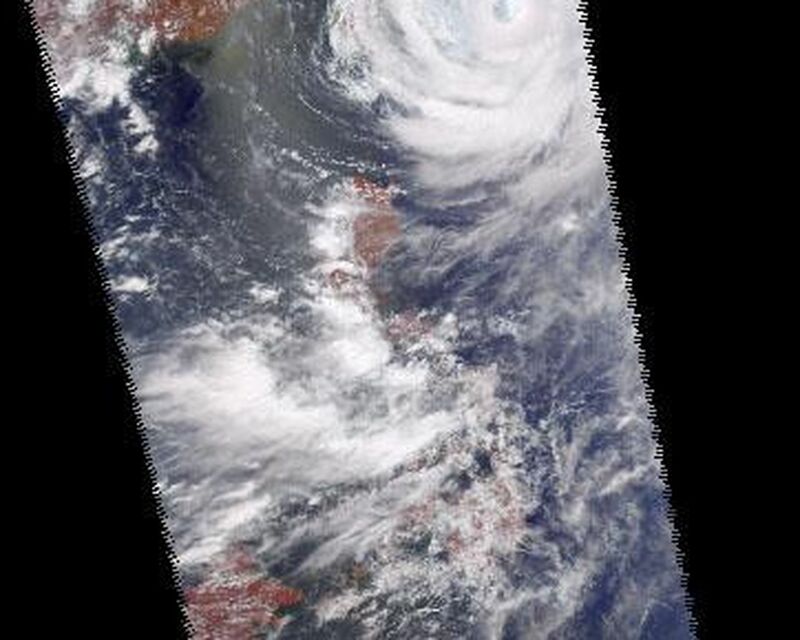 Four images of Tropical Cyclone Ramasun were obtained July 3, 2002 by the Atmospheric Infrared Sounder experiment system onboard NASA's Aqua spacecraft. The AIRS experiment, with its wide spectral coverage in four diverse bands, provides the ability to obtain complete 3-D observations of severe weather, from the surface, through clouds to the top of the atmosphere with unprecedented accuracy. This accuracy is the key to understanding weather patterns and improving weather predictions. Viewed separately, none of these images can provide accurate 3-D descriptions of the state of the atmosphere because of interference from clouds. However, the ability to make simultaneous observations at a wide range of wavelengths allows the AIRS experiment to "see" through clouds. 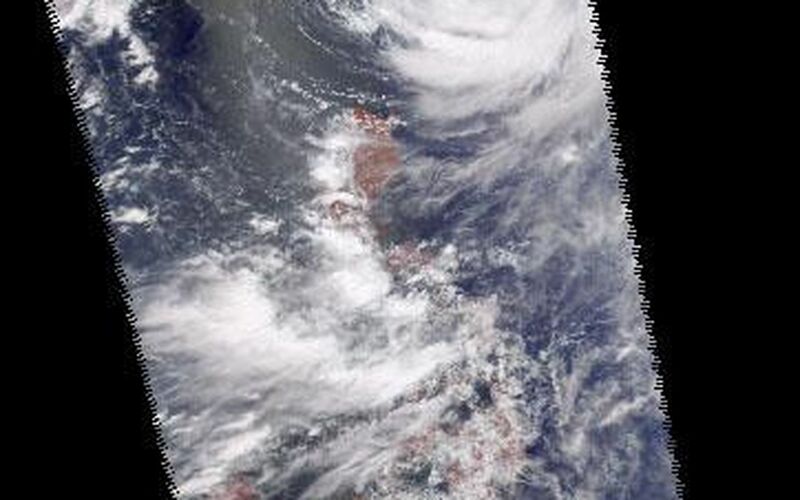 This visible light picture from the AIRS instrument provides important information about the location of the cyclone, cloud structure and distribution. The AIRS instrument image at 900 cm-1 (Figure 1) is from a 10 micron transparent "window channel" that is little affected by water vapor but still cannot see through clouds. In clear areas (like the eye of the cyclone and over northwest Australia) it measures a surface temperature of about 300K (color encoded red). In cloudy areas it measures the cloud top temperature, about 200K for the cyclone, which translates to a cloud top height of about 50,000 feet. On the other hand, most clouds are relatively transparent in microwave, and the Advanced Microwave Sounding Instrument channel image (Figure 2) can see through all but the densest clouds. 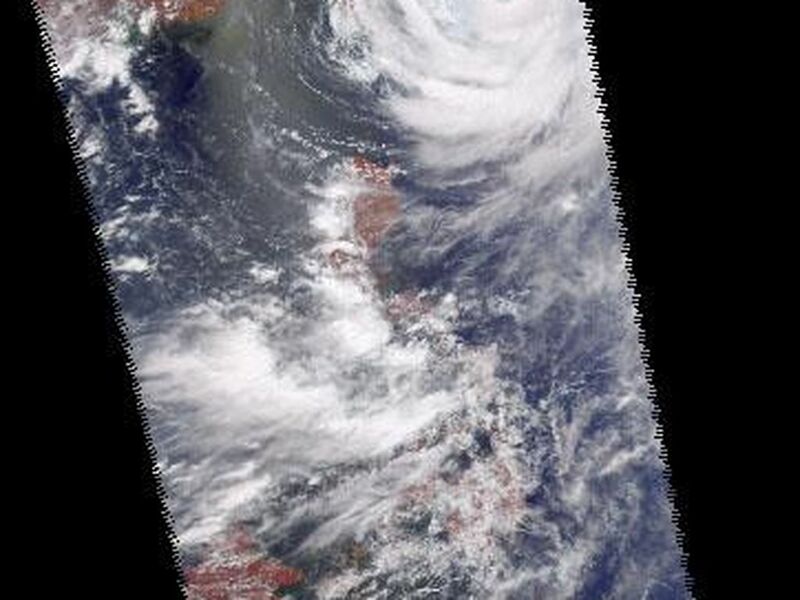 For example, Taiwan, which is covered by clouds, is clearly visible. The Humidity Sounder for Brazil instrument channel (Figure 3), also in the microwave, is more sensitive to both clouds and humidity. Only in clear, dry regions, such as the eye of the cyclone or the area north of Australia, does it see the surface. It is also severely affected by suspended ice particles formed by strong convection, which causes scattering and appears to be extremely cold. These blue areas indicate intense precipitation. The Atmospheric Infrared Sounder, AIRS, in conjunction with the Advanced Microwave Sounding Unit, AMSU, senses emitted infrared and microwave radiation from Earth to provide a three-dimensional look at Earth's weather and climate. Working in tandem, the two instruments make simultaneous observations all the way down to Earth's surface, even in the presence of heavy clouds. With more than 2,000 channels sensing different regions of the atmosphere, the system creates a global, three-dimensional map of atmospheric temperature and humidity, cloud amounts and heights, greenhouse gas concentrations, and many other atmospheric phenomena. The Humidity Sounder for Brazil, HSB, is a 4-channel microwave sounder provided by Brazil that obtained humidity profiles throughout the atmosphere even under conditions of heavy cloudiness and haze. The HSB provided high quality data until February 2003. Launched into Earth orbit in 2002, the AIRS, AMSU, and HSB instruments fly onboard NASA's Aqua spacecraft and are managed by NASA's Jet Propulsion Laboratory in Pasadena, Calif., under contract to NASA. JPL is a division of the California Institute of Technology in Pasadena.